Address: 1031, Budapest Szentendrei út 135-139. Storages of the Budapest Historic Museum preserved one of the largest archaeology collections in Hungary. 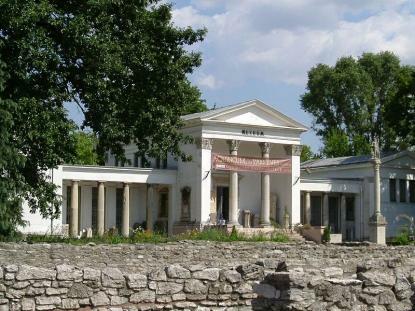 An archaeology collection with millions of objects from ancient times to the Original Settlement is located in the Aquincum Museum. The exhibition hall is now spacious enough to hold the freshly restored mosaics and wall paintings from the governor's palace excavations. The visitors can also see monumental statues which formerly stood in sanctuaries, the dolphin fountain or a reconstruction of a large ornamental stone vessel (crater). These objects all reflect the luxurious nature of the palace's interior. The Tegularium is actually a brick storage with an exhibition at its cozy opposite side. The exhibition undertakes to show through examples from Aquincum where and how these Roman bricks were made as well as other ceramic, how they were used, what the signs and markings on the bricks tell us. Finally we illustrate the development of bricks as field of research on a tableaux briefly.